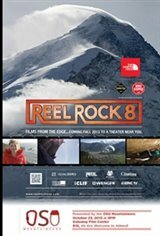 The eight annual Reel Rock Film Tour brings the best in climbing and adventure films to local audiences across the globe. Reel Rock shows are spirited events where climbers and outdoors lovers come together to celebrate and sample the ultimate in adventure filmmaking. Prize giveaways, appearances by top climbers, and fundraising for non-profit organizations are always part of the party at Reel Rock events. For more information check out ReelRockTour.com.